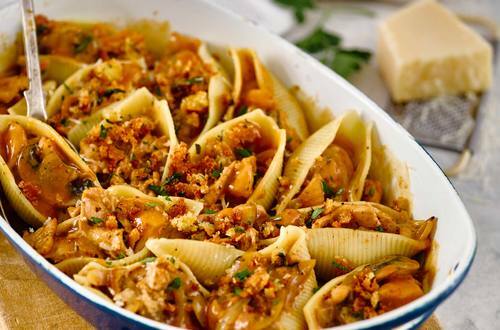 What do you get when you mix Chicken Stroganoff with a Pasta Bake? An instant family favourite! Serve with a salad or some steamed veggies for a simple and tasty mid-week meal. 1 Heat oil in a frying pan and brown chicken. Add onion and mushrooms and cook until tender. 2 Add Recipe Base and water and bring to the boil, stirring. Cover and simmer for 10 minutes, stirring occasionally. 3 Cook pasta according to pack directions and drain. Stir sour cream though the chicken and fill pasta shells with the mixture. 4 Place shells into a greased oven proof dish, sprinkle with breadcrumbs, Parmesan and parsley and brown under a hot grill.